We Take a Trip Into Unknown Waters with The Book of Dust : La Belle Sauvage ! 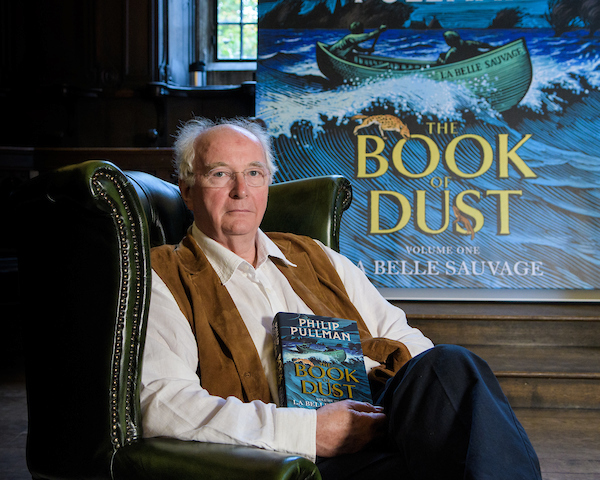 As huge fans of Philip Pullman and ‘His Dark Materials’ series, we’ve been on tenterhooks waiting for the release of this hotly anticipated new book set in the same universe ‘The Book of Dust : La Belle Sauvage’ the first volume within the book of dust series. Following the book’s launch and several appearances, Philip Pullman let slip a few scarce tidbits of information. We knew that the book itself would be set 10 years prior to the events of the first of the ‘His Dark Materials’ novels and would follow a new character. We were also given the impression the story would follow a darker route this time. So returning to the fold after 22 years we were keen to find out if the wait had been worth it – we’re pleased to say, in a word – yes. Evidently from the first hushed whispers of ‘The Book of Dust’ we knew the climax of HDM would be a hard act to follow. As remarkable as it was groundbreaking the series garnered fans worldwide for it’s incredible characters. Reading ‘La Belle Sauvage’ instantly puts you back in that familiar world of the alternative Oxford making it feel like almost no time has passed at all between books. Pullman’s descriptive narrative is as always superb and really puts you in the midst of the action as he almost leads you almost by the hand through an incredible range of new and familiar locations. This time we follow 11 year old pub landlord’s son Malcolm, who seems to live a world away from academic upbringing of Lyra. Malcolm’s life mostly seems to revolve around his father’s pub or exploring the many waterways of Oxford with his beloved boat ‘La Belle Sauvage’. However once again the political and religious organisation known as ‘The Magisterium’ have their hands in dark and nefarious deeds and whilst exploring, Malcolm and his daemon find themselves in the heart of something far bigger than they could’ve ever imagined. That adventure will lead Malcolm out of his small life at the pub, onto the oceans and beyond in order to protect someone incredibly important to the series. Without giving too much away, for any fan of Pullman’s or HDM the book is a must. It’s a phenomenal achievement that Pullman has managed to jump back into the world after 22 years and make it feel remarkably such a part of the existing series of HDM books. Malcolm is an altogether different character to Lyra or Will – with most certainly a different sensibility and viewpoint. Yet Malcolm is obviously a character that’s easily relatable, and within this world has a feeling of familiarity to him. It’s also fantastic to get a new perspective on the world of HDM through someone else’s eyes entirely. We also have a chance to visit a range of whole new locations, seeing the underside of Oxford which perhaps we didn’t glimpse too much of initially. But more than that – we get a chance to venture out to some more exciting locations not previously discussed. Pullman has said some of these have been previously hinted at through Easter eggs in his other publications so it’s genuinely intriguing to venture into such new climes. It also has to be said the cover art of the standard edition by Chris Wormell is simply stunning and more than worth the price alone. You will be hard pushed to not want to finish the book in one read. It’s thoroughly engaging and reminds you of what a rich world HDM inhabits, we can only waited with baited breath for book 2.